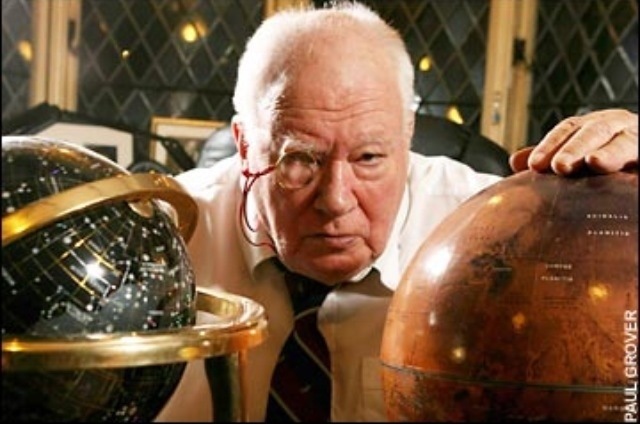 Sir Patrick Moore died on December 9, 2012 (Credits: Paul Grover). Patrick Moore, renowned for his work mapping the Moon’s surface and as a popular science broadcaster on British television, passed away on November 9 at the age of 89. Moore succumbed to an infection at his home in Selsey, West Sussex, after a short hospital stay. “My own research — mapping the Moon — now belongs to the past, and my role, if I have one, is to try and urge others to do things which I could never do myself,” he said about himself in later life. Moore was born at Pinner, Middlesex in 1923. 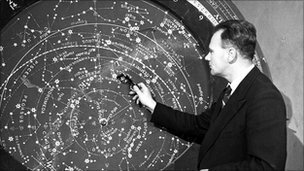 He was educated at home because of heart problems and his lifelong passion for astronomy was sparked by his mother’s copy of GF Chambers’ “The Story of the Solar System”. When World War II came, sixteen year old Moore joined the Royal Air Force by lying about his age, eventually reaching the rank of Flight Lieutenant. However, the war took away from him his fiancée, killed by a bomb while she was driving an ambulance. After that, he never married. Moore’s lunar research was used by both the U.S. and Soviets space programs. In 1959, the Soviets used his research to correlate the never-seen-before Luna 3 pictures from the far side of the Moon. Before the NASA Apollo missions, he was also directly involved in lunar mapping. Moore during “The Sky at Night”. He h\was been the presenter of the show for more than 50 years (Credits: BBC). From 1957 until the very end of his life, Moore hosted a popular monthly BBC program “The Sky At Night,” making him the world’s longest-running presenter of the same television show. His skill at explaining the universe along with his characteristic figure and the idiosyncratic style of his speech made him popular and beloved by a multitude of space fans as well as an inspiration to generations of astronomers. In 2001, Queen Elizabeth II knighted him for “services to the popularisation of science and to broadcasting,” recognizing his efforts and his hard work.